We’ve lovingly remodeled close to 90 percent of this home, which is a private South West Ridge Road residence with five bedrooms and three and a half baths. After a hard day of skiing, hiking or biking know that you’ll come back to one of three queen sized pillow-top beds or two very kid/teen/tween-friendly bunk rooms each with both twin and double beds. 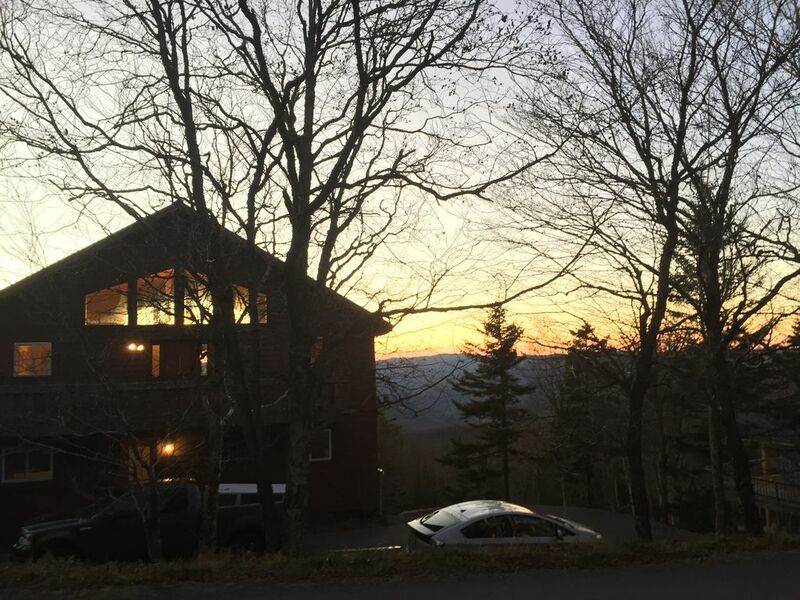 The back two bedrooms each have access to the large second level deck where you can take in the view of the sunset, valley or some of the frequently visiting deer. Bathe in one of two spa-like bathrooms with heated floors and custom tile. One bathroom has an oversized shower, the other a jetted Jacuzzi tub for soaking weary bodies. High-quality towels and linens are included in the rental fee. Climb to the top floor to the huge main living area and be awed by the view! (It is, in all honesty, what made us fall in love with the property.) French doors will take you out to the newly built third level deck where dinner and drinks can be served in the warmer months. If dining outside isn’t an option, don’t worry. Our huge dining table comfortably seats twelve (or more!) guests and still has a west-facing view. The well-appointed kitchen features stainless steel appliances, microwave, blender, crockpot, coffeepot (or a French press if you want to be fancy) and plating for twelve. Fire up the cast-iron gas fireplace and cuddle up on the large sectional couch to watch a movie or game on the 55” HD TV with 100+ DISH Network channels and a DVR. It’s not far from the couch to the custom-made, hand crafted, one-of-a-kind bar. (If that seems like too many descriptors, you won’t think so when you see it. It is a stunning piece.) Behind the bar is a sink and small wine refrigerator to keep reds cool or whites cold. We’ve got games and books to occupy guests of all ages. Take a seat in one of our UVA rockers to read a book, study a trail map or just soak in the West Virginia skyline. Finishing out the top level is a large half-bath. The basement level boasts one of those two bunk areas; a foosball table and mini-fridge (for intense matches); a full bathroom; and a media room with projector, 96 inch screen, gaming system, and surround sound. After an active day, this is where you want to watch movies or play video games. Condo rentals can be crowded, noisy, and check-in is often a bear. That’s not the case at the ‘Hoo House. You’ll drive straight to the door, park in a private driveway that easily holds six mid-sized vehicles and type your unique access code into the door. Snowshoe’s free shuttles will collect you at the top of the driveway and take you to and from the village with just a phone call. The house is about a half mile from the Western Territory slopes, so if you and your ski/snowboard boots are up for the “hike” the slopes are within trudging distance. This is our beloved home away from home, so we’ve included many handy features like USB ports in many of the outlets throughout the house, a Sonos sound system that can connect to any smart device for playlist listening (with a free APP), and free Wi-Fi. Additionally, we are a family with young children, so the house also has a baby gate, highchair, two Pack –n- Play cribs (and sheets), toys, books, kid-sized dining implements and other assorted kid-related necessities. We know traveling with kids involves a lot of stuff. Because you’re wise enough to rent the ‘Hoo House, you no longer have to jam your vehicle full of said stuff. We want to keep our home family friendly, so we insist that our home be pet and smoke free. Despite the collegiate name, this is not a college party house; minimum age for rental is 25 years. 100% refund 30 days prior to check-in; 50% refund less than 30 days prior to check-in. We are a family of 4 from Southeastern, VA. Bought this house in 2013 and have been renovating it ever since. We love the area and enjoy being outdoors. This property offered a view that others couldn't match. The sunset is amazing. Deer in the back yard, views, walking distance to the slopes, hiking, skiing, capped at the end of the day with a movie or a drink with friends. 2.5 bathrooms. Two bathrooms on the entry floor. Both have showers with one being a walk in shower and the other a jacuzzi tub. The half bathroom is on the top floor. Beautiful views from 3 story deck. Single zone. The stove is on the top floor and puts out a lot of heat. Double level oven with stove on top. We have the basics. Pots, pans, plate settings for 10. The main level floor has 4 bedrooms and 2 full bathrooms, all very nicely updated and well appointed. Downstairs is a large room with a bunk bed (but no window coverings, so way too bright to sleep there), a laundry room, a full bath room, and a media room. This was a great place for the kids to play and run around. Upstairs is the kitchen, dining area, living room, and bar. There were plenty of dishes, cookware, silverware, etc and the kitchen was overall very nice. Plus there was some empty cabinetry for us to put our own food, which was great. The table was really large and easily seats 10-12. The views from the back deck are spectacular - you really can't get better than this! The owners were very responsive and good at communicating. There were a few minor issues (fireplace didn't work, instructions for the media room weren't very good) but overall we loved the place and would definitely stay again. My family and one other rented this house for a ski trip last week and we loved it. The views are amazing, it's very convenient (takes less than 5 mins to get to the village), and it had everything we needed. The kids all loved the bunkbeds and theater room and the adults all enjoyed the top floor with the kitchen, dining room, bar area, and living room. We would definitely stay here again! We had a great time! The owners were very, very responsive to a few hiccups we had with a door that wouldn’t shut and some supplies we needed. Also Amy helped us tremendously with advice for parking and getting out of the driveway when it snowed almost a foot while we were there! We have a two wheel drive and she suggested we park at top of the world and thank heavens we did because I’m not sure we would have made it out. Only a few flaws, the satellite TV was in and out all week, the internet would also go out randomly, but I imagine it was due to the snow storm. Also they have children’s toys and movies and books to keep young ones entertained. The shuttle service was great, always there within 5-10 minutes of calling. Thanks for sharing your house with us again this year! Rooms comfortable place to stay. We enjoyed our stay and look forward to returning for another visit. Plenty of room for the 10 of us. DO NOT MISS OUT ON THIS WONDERFUL PROPERTY! What a wonderful experience we had with family of all ages who came from MD, NC and FL to ski and celebrate the New Year. First of all, the pictures do not do the home or location justice; they are both much better in person! The convenience of the Snowshoe Resort shuttle coming to the end of the driveway to pick us up and return us felt like we had our own concierge service. Not mentioned, but worth calling out, and that is, about a five minute walk at the end of their road, you can jump on the Western Territory run and essentially have close to a “ski in/ski out” situation. The biggest compliment is to the owners, John and Amy Robb, from the welcome call when we arrived to us having a small issue that required their attention, and I cannot tell you how they went above and beyond to address. They are the best.